At INBP (my school) there are different kinds of trainings. The one I'm doing is the CAP and it concerns the foundations of French pastry. Currently there are 4 groups of 16 people following the same program. 3 times a week (the other 2 days we have a later schedule) we start at 6am, which means that I wake up at 4h30am (no, this is not a typo), get ready (I had to shorten my morning preparation to 45 minutes), leave home under moonlight for a 20 minutes journey. At the school, we storage our tool case and cloths in dedicated lockers to get into the workspace, the 'labo' (short for laboratory) with the professional outfit, slip resistant shoes, apron and hat. No nail polish (hygiene issues) or jewelry (security issues). Once in the 'labo' we are organized in pairs that lasts 2 weeks. Every Monday the teacher distributes the recipes of the week and explain how the day will go. He demoes the steps we have to follow (key moment to get as much as we can from his knowledge and experience), then we try to reproduce the recipe by our own. My teacher has amazing technical skills, so we have a very good reference to look up at. Of course, cooking in a lab is way more comfortable than in our kitchens. 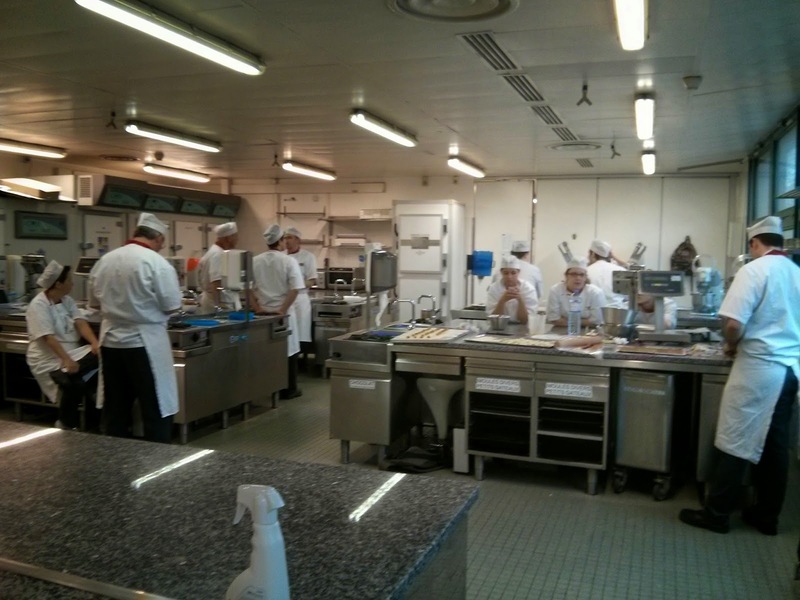 Big marble worktops, professional ingredients and materials, huge sinks, huge ovens, huge freezers and fridges. We have a professional stand mixer, a gas hob and a scale per pair of students. In the beginning, I felt very much in a rush. Some days, I didn't even have time for a small break. Also all the changes, mainly on the schedule were hard to manage. I even lost weight, which is a paradox for a pastry program. No worries: I gained it back again since then :p.
But little by little I've learned the gestures and now it feels much more mastered. At this stage (3 months of training gone and 1 month to come) we already covered most of the program. From now on, we are mostly practicing the stuff we did before and it feels good to see the big path we went through. On the 23th of May, we'll have our last class. And on the 3th of June, our CAP practical exam. The writing ones will come on the 12th of June. What we do with our production? In some schools the students are allowed to take all their pastries home. At INBP, we can eat as much as we want during the classes. Then we can take all the breads (croissants, pains au chocolat, pains au raisin, chaussons aux pommes, brioches, etc.). For the other pastries (cakes, pies, single serving pastries) we can take one per month for free. For more, we pay the equivalent of 50% of the normal price. For the rest, they are frozen then sold to charitable institutions around Rouen. Besides the practical classes, we also have Arts classes once a week for 2 hours. It's a very relaxing and 'open minding' class. Our teacher has a pretty impressive background that he brings to the pastry world. Referring to artists, books, museums, he demonstrates that inspiration can come from very different sources. That makes me think of Pierre Hermé (one of the most important pastry chefs in the world) who gets insights from fashion and arts to create his masterpieces. 6 hours/week. Pastry is known as an exact science. Indeed, the chemicals will play a key role in the results of a recipe: how salt, sugar, water, flour, yeast, chocolate, fruits, etc. will work and interact. Why the order of ingredients change the recipe, how to choose the right flour for the right product. How to play with different air and temperature conditions. And a bunch of other variables. Pastry is alchemy and if you want to create your own magic potion, you have to understand these basis. 2hours/week. 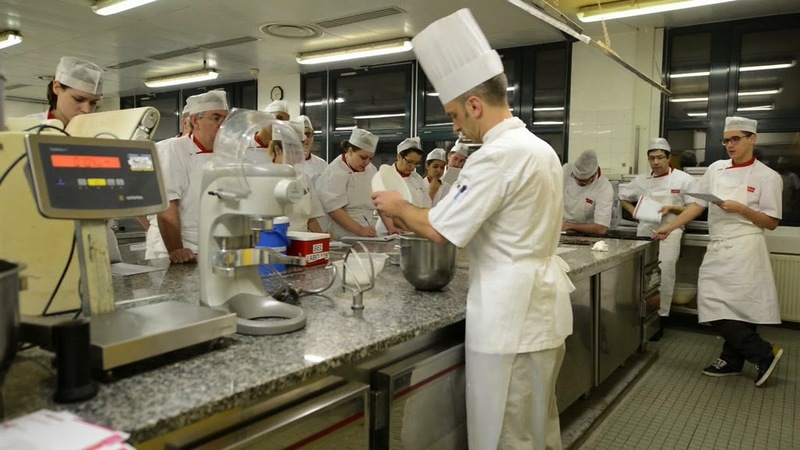 They are a mix of the basic stuff we need to know as pastry cooks: how electricity works, how to avoid food contamination, how the microorganisms develop, how a microwave oven, fridge or freezer work, hygiene rules, why it's important not to re-freeze a preparation, etc. Worthy as I've learned a lot of stuff about things we use but never think about. 1 hour/week. All about the laws and rules of a pastry SMB (small and medium business) in France. We also get to know some basics about how to manage stocks and how to calculate benefits. According to wikipedia, a sabbatical is a rest from work, or a break. It would be so fantastic to see all of it live..I always enjoy watching the chefs and cooks to the beautiful and yummy food just like this,I hope all of you will be great chefs of tomorrow..best of luck.